Here is only one way of getting your avatar. 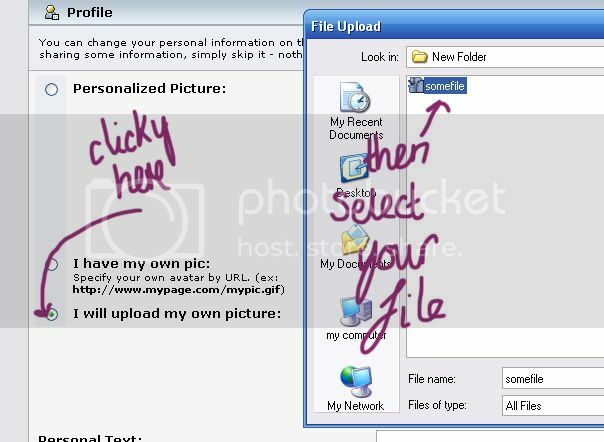 The other way just requires you to, instead of clicking the last option on step 3, click the second option and insert your picture URL. Click where the arrow is pointing to on the picture. Thank yous to Lyncheh for posting this to ACX, kupika's forum previous to kupika.net thanks to kupika downtime. Is your kupika username different to your kupika.net username? I put my link in my profile and not in my signature. That works too. 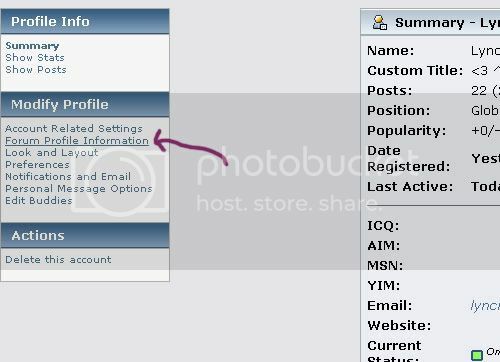 In Profile > (Modify Profile) Forum Profile Information > and down the very bottom there is a website option. To access this for members you see around the forums you can just click on the left of their post, as well. I put my title as Sanyu @ Kupika, as you may notice when you look at my profile (click my username to the left) or hover over the to the left. Hina has added a new option to profile pages to add your kupika username. It will appear at the side of your post, as Sanyu does on mine. To add this feature, do the same as above. Profile > (Modify Profile) Forum Profile Information > Kupika username. Only type your username, though. You don't want to stretch your sidebar every time you post with a long link, ne? Now, forums like this don't usually enable HTML in things like signatures. Sometimes they do, but mostly they will use what is called BBCode. When you click reply in any thread, and use the options given as buttons at the top, it will enter BBCode into your screen. You probably noticed if you clicked that [b] these brackets [/b] showed up around your text. the [ and ] are what replace HTML's < and > brackets. They're used differently in BBCode though. To add a picture to your signature, you would put [img] tags around the picture URL. On kupika, hina set it up so that picture links automatically parsed into the picture itself, provided the link did not exceed the line width. Here on the forums, you need to use the IMG tags, or your picture will just show up with a link. Please don't spam forums; they are not the FT.
You can "test" your signature by clicking "Profile" (as usual) and going to the bottom of your Summary page. Click "Show the last posts of this person" and click on one of the topic links. Your signature auto updates on all of your previous posts! Before posting a new topic, please make sure that there is not already a topic on the same subject. You can do this by just browsing the different boards, or by entering a few keywords into the search, to see whether there is already a similar topic.